Slow-cooked, shredded Callicrate Beef will be available at the Colorado Farm and Art Market on Wednesdays and Saturdays through Oct. 10… tucked inside the gourmet tamales handmade by local food artisan Lorena Jakubczak, a well-known vendor at the seasonal Colorado-only farmers market. 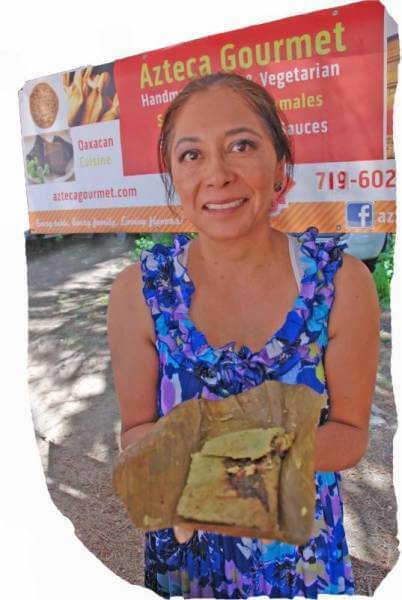 Lorena introduced her Callicrate Beef tamale for the first time Wednesday during the farmers market at the old Ivywild School. While Lorena was fine-tuning her recipe, she used regular grocery store meat, switching to Callicrate rump roasts after her formula was perfected. Lorena’s Coloradito mole beef tamale is a hefty 10 ounces. “It’s a meal,” she says. The recipe contains four different dried peppers and authentic hand-ground Oaxacan cocoa. All of her authentic Southern Mexico-style tamales are based on original family recipes. Lorena wants to add chicken and eventually pork to her existing line-up of gluten free, vegetarian offerings. She is also hoping to make her meat tamales available for sale at the Ranch Foods Direct store starting later this fall. It was her unique dessert tamales that originally launched her business last winter when she found herself with an abundance of leftover pumpkin pie filling. The subtly sweet dessert tamales are perfect for breakfast or as an afternoon snack with coffee, and feature popular fall flavors like apple and pumpkin pie. She also makes her own fresh salsas and avocado cream. The Colorado Farm and Art Market has only four more markets remaining in the season. Saturdays, you can find the markets at the Margarita at Pine Creek restaurant from 9 a.m. to 1:30 p.m.; Wednesdays at the Ivywild School, from 3 p.m. to 6 p.m., through Saturday, October 10. Locally grown peppers and tomatoes are particularly abundant this fall! Stop by the outdoor market and enjoy the festive atmosphere before time runs out. CLICK HERE to visit the Azteca Gourmet website.